This race has been re-scheduled for Saturday June 4. All past registered participants are automatically rolled over to the new date. There are still spots available, so new registrants are welcome to register. The scenic course may humble you, with its 1,880 feet of climbing and descending - but at the same time, the remarkable surroundings will energize you as you navigate the lush hiking trails of the Santa Cruz mountains. 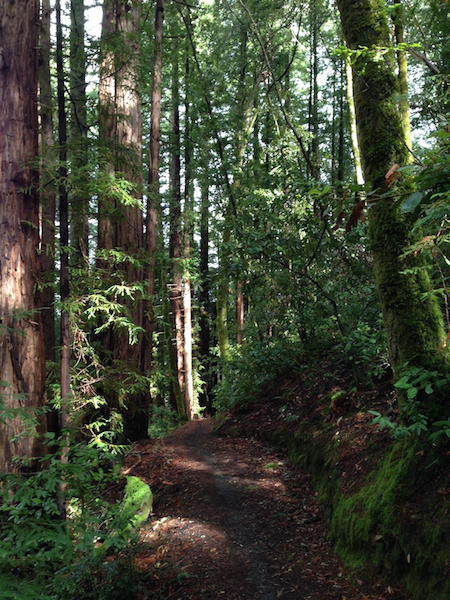 Along the course, you'll be shielded by redwood and oak forests and bordered by sprays of vibrant wildflowers. The climb will take you just shy of reaching Skyline Blvd. Who wants to be reminded of traffic anyway? At the turn-around aid station, you'll be able to fuel up for your descent back into Woodside. 5-milers turn around at an earlier point along the course. This is the half marathon that will rocket you towards your spring marathon goal. The event is limited to 300 participants so don't wait too long to register! COURSE CUT-OFF TIME: 3 HOURS (13:45min/mile pace for half marathoners, 36min/mile for 5 Milers). Hikers/Walkers are welcome to participate. COURSE MARKINGS: The course will be marked with orange ribbon. The 5 Mile turnaround will be marked with an orange X. The half marathon turnaround is designated by the aid station. AID STATIONS: There is one aid station at mile 6.5 (half marathon turnaround). There will also be food/drink available at the finish. We highly recommend that you carry water. PARKING: is $6 per vehicle in Huddart County Park. Sorry, no dogs are allowed in Huddart County Park. Rangers will not even allow you to drive into the park with a dog in the car. DRIVING DIRECTIONS: Google Maps Link to Park Entrance. Take the Woodside Exit (Hwy. 84) off of I-280. Continue west on Hwy. 84 (Please observe the 25 mph speed limit and share the road; this is a cyclist-friendly town). 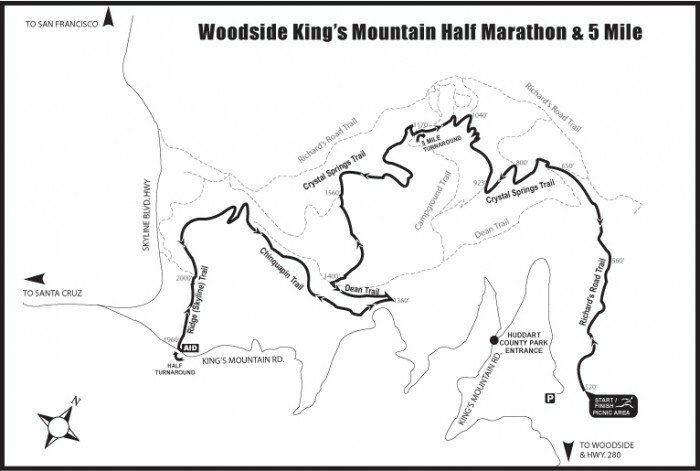 Turn right on King’s Mountain Road and continue approximately two miles to Huddart Park. Drive all the way to the bottom of the park to the large parking area on the right. We will meet in the East Meadow picnic area. CANCELLATIONS: Registrations are non-refundable and non-transferable. If you email us by January 28, you may receive a rollover credit (the amount you paid minus a $10 fee) to use toward any future Enviro-Sports race.